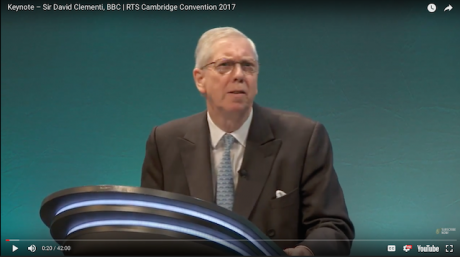 Screenshot: Sir David Clementi giving the keynote speech at the BBC/RTS Cambridge Convention, 2017. Youtube.In his “ I Have A Dream” speech at the March on Washington”1963, Martin Luther King declared that the American constitution was a promissory note that had been returned marked “insufficient funds”. For diversity, the BBC Charter has become a promissory note that has been returned marked insufficient commitment and inadequate regulation. BBC external supply amounts to £1 billion annually. Last year, £433 million was spent with the independent production sector, and hundreds of millions more with rights holders, performers, talent directors, production resources and musicians. Ofcom has now announced its final plans for regulating the BBC and nothing is being done by Ofcom to hold the BBC to account for employment diversity in this £1 billion expenditure and there are no signs that the BBC Board is doing anything either. Ofcom specifically excluded the Diversity Article 14 from its consultation on BBC regulation. Equality experts remain baffled by this and Ofcom has never explained why. Ofcom was reluctant to take on regulation of the BBC and it didn’t want to get involved in regulating off-screen employment diversity. Ofcom’s original draft proposals published in March 2017 didn’t address off-screen diversity at all. Sustained campaigning by Sir Lenny Henry, Campaign for Broadcasting Equality, Directors UK, NUJ, Stonewall and powerful interventions from the DCMS Secretary of State, Karen Bradley, Digital Minister, Matt Hancock, with Baroness Bonham-Carter, MPs David Lammy, Helen Grant and others caused Ofcom to move a little. Ofcom is now requiring the BBC to introduce a Code of Practice by April 2018 which will include “workforce diversity of commissioned production teams”. But there are no requirements to measure diversity in BBC external supply. Ofcom claims it has no powers to do this. If Ofcom believes it has no such powers, it should be seeking to get them. Diversity campaigners, seeking to advance this issue, could face significant hurdles. The “indie” sector will not want it. The “indie” sector is represented by PACT, a trade association. PACT’s Chief Executive, John McVay, is a tough, shrewd, effective politician who has done well for his members. In particular, he negotiated elements in the last Charter which saw a larger proportion of BBC spend go to independents, and in the new Charter he has ensured that all BBC programming will become open to independents. McVay headed the diversity working group on the DCMS Creative Industries Council and is Chair of the Creative Diversity Network (CDN). McVay is well placed to resist such change. We do not know the view of Ministers but people who have their ear say they don't think that extending the regulatory perimeter to include independent production companies that work with the BBC is a feasible approach. They argue that indies are commercial companies that work with a range of other public and commercial providers beyond the BBC and that introducing regulatory requirements and performance measures to secure greater diversity in external supply would risk undermining a well-functioning competitive market. This projects a fragility onto the indie sector which is very far from the robust reality. Last year the top 100 indies had a combined turnover of £1.94 billion and this is growing fast thanks to the demand from companies like Amazon, Apple, Google and Netflix. In the commercial market suppliers are required to meet different specifications for different projects. There is no reason why some specific diversity requirement should not be part of the spec from the BBC. It is part of the spec from Channel 4. Channel 4, which does not receive public funds, is far ahead of the BBC and other broadcasters on diversity. Unlike the BBC, C4 has specific % diversity requirements, including off-screen, for independent commissions. These were met for 83% of commissions in 2016. Although C4 publishes an exemplary annual assessment of each of its thirty diversity initiatives, the impact of its Commissioning Diversity Guidelines requirements remains opaque. Channel 4 should now advance to publishing granular data on what has been achieved in employment diversity through these guidelines, as well as diversity data on the top ten programmes in each genre. Setting and implementing BBC diversity requirements for external supply may be a complex challenge but as Karen Bradley told the RTS Cambridge Convention, “The BBC should be leading the way with both on and off-screen diversity………It will not be straightforward but just because something is hard does not mean that we shouldn’t try.” It is time for the BBC and Ofcom to address the £1billion diversity gap. The BBC should not be trailing so far behind Channel 4. We shall have to wait until next year to see what progress BBC and Ofcom can make. A lot will rest on the terms of the new BBC Code of Practice, the associated enforcement procedures and penalties for falling short – and also on the provisions in the new Annual Plan. This month, appearing before the Commons Digital, Culture, Media and Sport Committee, the BBC Chair, Sir David Clementi, distanced himself deftly from the current BBC Report and Accounts saying, “The 17/18 budget was pretty much baked by the time this Board was put in place in April of this year.” Clementi added, ”The set of accounts that you have in front of you, we have published and do take responsibility for, but essentially relate to a year when the new Board was not in place and the old arrangements were.” This justifiable “not me guv” approach must also apply to the current BBC Annual Plan. The BBC Annual Plan provides a basis on which Ofcom monitors the BBC’s progress towards meeting its own goals. The BBC Annual Plan for 2017/18 section on diversity was based on unreliable assertions and was limited in scope. When the 2018/19 Annual Plan and the diversity Code of Practice are published we will see if the BBC Board plans to deliver effectively on internal and external diversity of employment. With no grounds for optimism, we can only hope that the £1 billion of public money spent on BBC external supply will be spent for the benefit of everybody, drawing on all the talents of the country and that Article 14 Diversity will prove to be worth the paper on which it is written. As ever, in this, the seventeenth year since the first comprehensive BBC Diversity Action Plan, we continue to live with diversity deferred.